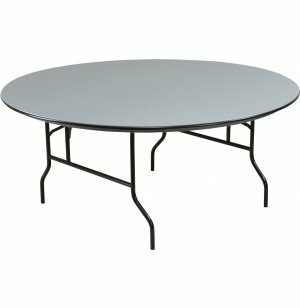 Round Lightweight Banquet Table 72"
This round lightweight folding banquet table offers the durability of hard thermoplastic and the flexibility of a lightweight table that is easy to set up and move around. The surface is specially engineered to resist damage from normal use. It will not crack, splinter, or warp. 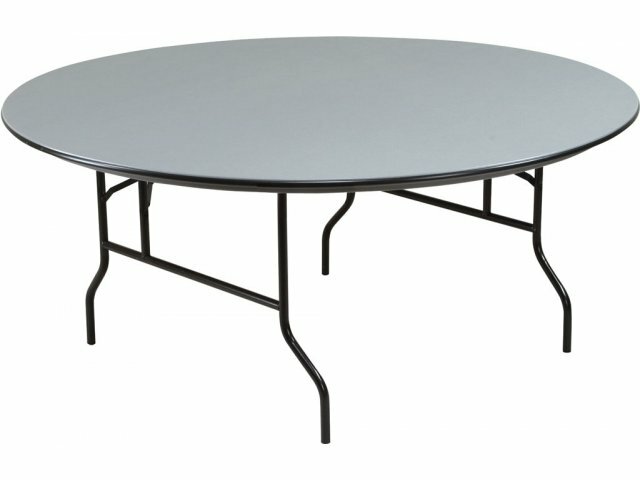 The eight-foot length easily accommodates up to twelve guests, and the wishbone legs are placed closer to the center of the table to provide for greater legroom. Durability is based on the steel carriage underneath the thermoplastic surface. It is designed to withstand being opened and closed thousands of times. High-impact leg glides help prevent damage to flooring while tables are being moved. Provides 5 layers of protection against impact from rough handling. All metal parts are finished with a thermofused epoxy powder coating. QuickShip colors (Gray Top, Black Frame) will leave factory to US addresses within 2 business days when ordered before 1 PM Mon-Fri Eastern time.